These steps show how to programmatically create an individual enrollment for a TPM device in the Azure IoT Hub Device Provisioning Service, using the Python Provisioning Service SDK with the help of a sample Python application. Although the Python Service SDK works on both Windows and Linux machines, this article uses a Windows development machine to walk through the enrollment process. Make sure to set up IoT Hub Device Provisioning Service with the Azure portal before you proceed. Build and compile the Azure IoT Python SDK. Follow these instructions to build the Python packages. If you are using Windows OS, then also install Visual C++ redistributable package to allow the use of native DLLs from Python. This section shows how to add the provisioning details of your TPM device to the sample code. Using a text editor, create a new TpmEnrollment.py file. Add the following import statements and variables at the start of the TpmEnrollment.py file. Then replace dpsConnectionString with your connection string found under Shared access policies in your Device Provisioning Service on the Azure portal. Replace endorsementKey with the value noted previously in Prepare the environment. Finally, create a unique registrationid and be sure that it only consists of lower-case alphanumerics and hyphens. Save and close the TpmEnrollment.py file. Open a command prompt, and run the script. Navigate to your provisioning service in the Azure portal. Click Manage enrollments. Notice that your TPM device appears under the Individual Enrollments tab, with the name registrationid created earlier. Close the Python sample output window on your machine. If you created a simulated TPM device, close the TPM simulator window. 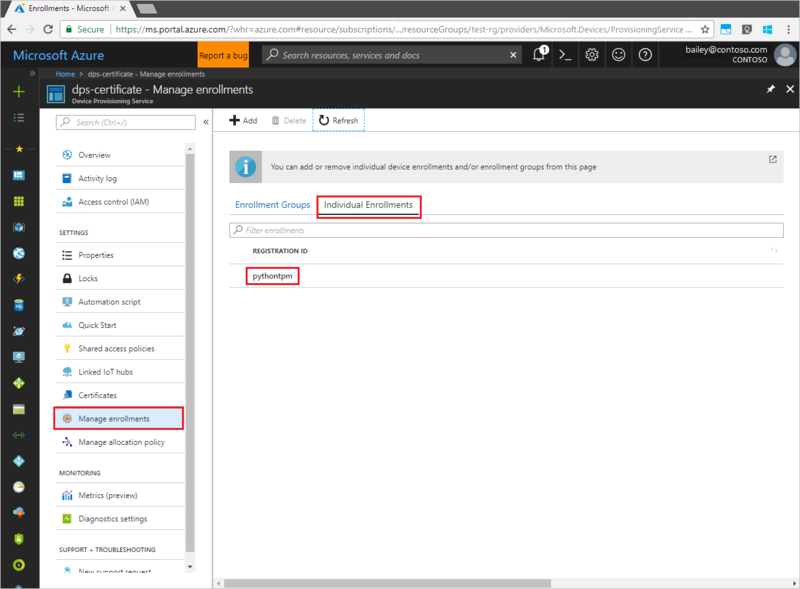 Navigate to your Device Provisioning service in the Azure portal, click Manage enrollments, and then select the Individual Enrollments tab. Select the Registration ID for the enrollment entry you created using this Quickstart, and click the Delete button at the top of the blade. In this Quickstart, you’ve programmatically created an individual enrollment entry for a TPM device, and, optionally, created a TPM simulated device on your machine and provisioned it to your IoT hub using the Azure IoT Hub Device Provisioning Service. To learn about device provisioning in depth, continue to the tutorial for the Device Provisioning Service setup in the Azure portal.